If you have had a total hip replacement surgery, there are certain precautions you need to take, especially if your surgery was done via a posterior approach. While your total hip rehab may have taken place in the hospital, at home, or in an outpatient clinic, you may benefit from the skilled services of a physical therapist for total hip rehab. The primary concern is the avoidance of a hip replacement dislocation in which the artificial ball of the upper leg (femur) slips out of the artificial hip socket. 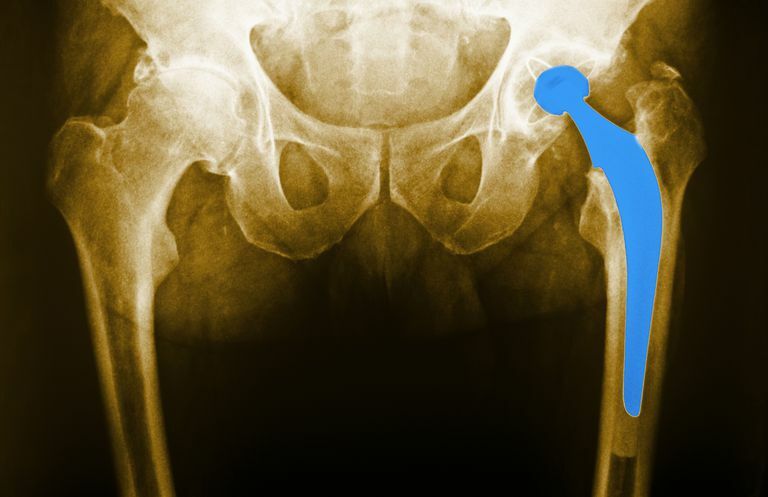 According to research from the University Hospital of Cologne, around 2 percent of people with a total hip replacement will experience a dislocation within a year, while 28 percent of revision hip replacements will experience the same. After a total hip replacement with a posterior incision, three movements should be avoided to prevent dislocation of the hip prosthesis. Not all patients need to comply with these restrictions, as they differ with the incision location and type of hip prosthetic used. Hip flexion past 90 degrees. This means that you should not bend your hip up too far or lift your knee too high. In general, your thigh must remain below the parallel line when compared to the floor. Sitting in a low chair or bending your knee and hip up to put on a sock may break this 90-degree rule and put you at risk for hip dislocation. Crossing your operated leg over your non-operative leg (adduction). When lying down, you should not cross one leg over the other to maintain this hip precaution. When sleeping, many people are required to use a special wedge called an abduction pillow to help keep their legs separated. Walking pigeon-toed (internal rotation of the hip). After a posterior approach total hip replacement, you should not rotate your hip inwards, or you may risk a dislocation. This means that your toes should be kept straight ahead or slightly rotated outwards when sitting, standing, or lying. When walking, be sure not to rotate your body over your foot on the ground in such a way that causes internal rotation of your hip. The best way to maintain your total hip precautions is to work closely with your doctor and physical therapist. Your PT can write your hip precautions down so you have a constant reminder. Most patients who fail to adhere to the prescribed precautions do so while simply moving around in everyday life. Sitting on a low chair or relaxing with your legs crossed is breaking your hip precautions. Sometimes, exercises, like vigorous straight leg raises, may place your hip in a position where you will be breaking your precautions. The bottom line: be careful. Your doctor will tell you when you are at minimal risk for dislocation and you no longer need to follow your total hip precautions. Most often, people need to maintain total hip precautions for approximately 90 days after surgery. Some doctors may have you maintain your hip precautions for about six months, others may only have you watch your motion for 60 days. It all depends on your health and mobility level prior to the surgery, the complexity of the surgery, and the speed of your post-operative rehabilitation and recovery. If you have any questions about your hip motions after your surgery, make sure you contact your doctor and ask about your total hip precautions. Remember that each and every person heals differently after total hip replacement surgery, Working with your physical therapist is the best way to ensure a safe and rapid recovery after your total hip replacement. Dargel, J.; Oppermann, J.; Bruggermann, G. et al. Dislocation Following Total Hip Replacement. Dtsch Arztebl Int. 2014;111(51-52):884-90. DOI: 10.3238/arztebl.2014.0884.